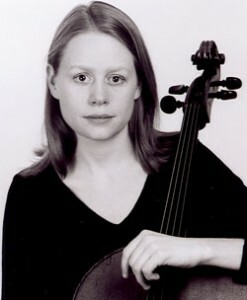 Possessing a “rare and particular aural beauty” and “unlimited technique”, Canadian cellist Bridget MacRae has distinguished herself internationally as a soloist and chamber musician. Since 2003 Principal Cellist of the Munich Chamber Orchestra, she recently was soloist in the Schumann Cello Concerto during the orchestra’s 2007 tour of Korea. Other recent solo engagements include performances with the Bavarian Radio Choir, recitals at the Grottammare Festival and the German Schubert Society, and Elgar’s Cello Concerto in London’s Queen Elizabeth Hall. She has worked under conductors such as Claudio Abbado, Simon Rattle, Daniel Harding, Loren Maazel, Heinz Holliger and Giovanni Antonini. Much sought after as a chamber musician, Bridget has collaborated with artists such as Angela Hewitt, Melvyn Tan, Jeremy Menuhin, the Vogler Quartet and Isabelle Moretti. She is cellist of the London Conchord Ensemble and of the Inukshuk String Trio, which was featured in Radio-Canada concerts in Montreal and Quebec in 2006. For a number of years she was the cellist of the internationally acclaimed Schidlof Quartet in the UK. Bridget is a regular guest at notable chamber music festivals including Prussia Cove, Ernen, Rheingau, Casals and Prague Spring. She has performed at Wigmore Hall, Birmingham Symphony Hall, the Berlin Philharmonie and the Prague Rudolphinum and has been broadcast by CBC, BBC, Polish Radio, Swiss Radio, Bavarian Radio and Deutschland Radio Berlin. In her collaborative work Bridget is known as a “sovereign and consummate musician” with an “engaging presence of tone” and passionate musical integrity. She has recorded chamber music CDs on the Linn, ASV, Black Box, Quartz and Hexagone/Radio-Canada labels. Bridget’s particular interest in contemporary music has led her to work closely with many prominent composers including Giya Kancheli, Arvo Pärt, Sofia Gubaidulina, Jörg Widmann and Oliver Knussen. Her virtuosic technical abilities and commitment to the realisation of a composer’s intentions make her a valued collaborator in the process of creating new works. Bridget studied in Victoria with James Hunter, at Yale University with Aldo Parisot and in Würzburg, Germany with Xenia Jankovic. She is the recipient of numerous awards from the Canada Council for the Arts, the Canadian Music Competition, the European Mozart Foundation and the Vancouver Foundation. She plays on a Giovanni Battista Priore cello from 1763.